This book provides an indispensable guide to the economic, political and diplomatic process that led to the creation of the European single market and the signing of the Maastricht Treaty. In this new, expanded edition Padoa-Schioppa presents a lucid assessment of the opportunities and risks that EMU entailed; assesses the economic, monetary, political, and institutional significance of the euro; and reconsiders the rationale and underlying philosophy of EMU in the light of recent developments. Padoa-Schioppa has brought together a selection of his papers and speeches, covering 1982-94, from his work as Deputy Director General of the Banca d'Italia, and has edited them thoroughly to illuminate the recent history of European integration. A central theme of his book is the belief that a group of sovereign countries cannot for long sustain free trade, unrestricted capital movement, fixed exchange rates and full autonomy of national macroeconomic policies, and so need to move towards a single currency. 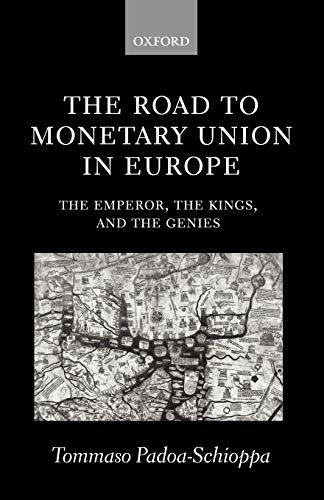 He discusses extensively such issues as the single currency, the tasks of a European central bank, the ECU, the role of budgetary rules, currency competition, and the relationship between EMU and political union. The author has created an insider's guide to this topical issue for students, academics, policymakers and commentators alike. This book contains extracts from documents and an extensive chronology which will be of particular use for readers. Tommaso Padoa-Schioppa is a member of the Executive Board of the European Central Bank. Previously he was affiliated to the Bank of Italy and the European Commission, and was Secretary of the Delors Committee.